For quilting and craft projects, the use of a rotary cutter can make cutting pattern pieces faster and improve accuracy in measuring. You can't use a rotary cutter, however, without a cutting mat to guide your cutting lines and protect your work surface. While you'll need to practice working with your cutting mat for the best results in cutting fabric, once you know how to use a cutting mat, you can cut as many as four to six layers of fabric at a time. Set the cutting mat on a flat table with the bottom edge pulled close to the edge of the table. Align the mat so the measurements on the horizontal edges count from left to right and the vertical edges count from bottom to top. Look over the mat to note how it is marked with horizontal, vertical, and a variety of diagonal lines typically denoting 30, 45, and 60 degree angles. Cutting fabric along the horizontal and vertical lines will slice the fabric on the straight of grain. Cutting on the various diagonal lines will create angled pieces of fabric. The 45 degree angle in particular can allow you to cut diagonally on the fabric, also called the bias. Position ironed fabric over the mat when you are ready to cut it so the fabric doesn't cover over the numbers along the edges of the mat. Adjust the edges of the fabric to run horizontally and vertically to have more control on the cut of the fabric. Lay a clear, rotary ruler over the fabric and align one edge of the ruler with a line along the mat where you want to cut across the fabric. Use the numbers at the edges of the mat as a guide for the ruler to ensure your ruler is running straight across the mat. Apply direct downward pressure to the ruler and mat to sandwich the fabric as you roll the rotary cutter like a pizza cutter along side the ruler that is aligned with a line on your mat. Direct pressure should keep the ruler and mat from shifting during use. Reposition the ruler as needed to continue to cut your fabric into the shape and size needed for your project. 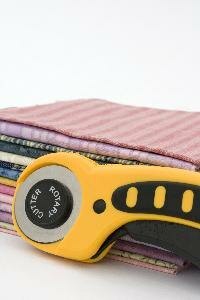 Avoid moving the mat and fabric each time you move the ruler for accuracy when possible. Always double check your ruler's position in relation to the mat before cutting to ensure you create the correct size of fabric. Wash the mat lightly when excess lint or fibers are sticking to it by wiping it down with a damp cloth and mild dish liquid. Wipe the mat a second time with plain water to rinse any cleaner away. Store the mat when not in use by laying it flat on a table or shelf, or slipping it under your couch or bed. The mat can be stored upright if you have sufficient support on either side of it, such as between pieces of cardboard, to keep it from warping or starting to bow. Replace your cutting mat if it is becoming too cut up or scarred to continue to give you consistent cuts. While many mats are marketed as "self-healing," none are cut proof.